It should come as no surprise to anyone that teachers around the country are jumping ship at an alarming rate. According to the Wall Street Journal,public educators “quit at an average rate of 83 per 10,000 per month in the first 10 months of 2018” – the highest rate for public educators since 2001. Even so, pay is not the only reason teachers are fleeing classrooms. They also cite inadequate public respect and increased accountability without appropriate support. In Arizona specifically, contributing factors include 25% of our certified teachers being retirement eligible, a grading system for schools that still relies heavily on standardized tests, a GOP-led Legislature that is very pro-school choice if not openly hostile to public district education and their teachers, and the lack of respect for the teaching profession demonstrated by the dumbing down of teacher qualification requirements. That last 1,404 certificates issued for the current school year is probably the most instructive, because this is after the 10 percent raises for teachers the #RedforEd movement garnered in 2018. So, less than one-third of the way into the school year, the state has issued almost half as many certificates to untrained teachers as the entire previous year. In other words, despite the 10% pay increase, Arizona districts are having even more difficulty attracting professional teachers into their classrooms. Part of the problem is no doubt an improved economy. After the 2008 recession, the classroom was a safe place to be employed; other jobs just weren’t to be had. Now though, teachers have other options. That, combined with the aforementioned factors, is putting school district governing boards in a bind. As the past president of the Arizona School Boards Association, believe me when I tell you that governing boards do not want less than fully qualified teachers in their district’s classrooms. But, when push comes to shove, sometimes they are left with little choice. And although a 2017 AZ Republic statewide examination of teacher quality found that “it is rare for schools to fill full-time teaching positions using Emergency Substitute Certificates” (requiring only a high-school diploma), in 2016–17 more than 40 of those teachers were leading classrooms. The Republic also found that "22 percent of 46,000 Arizona teachers either did not meet the state’s basic qualifications or had less than three years’ teaching experience.” And, that over 62% of the state’s almost 8,600 teacher vacancies either had not been filled or were filled with people who couldn’t qualify for a standard teaching certificate. 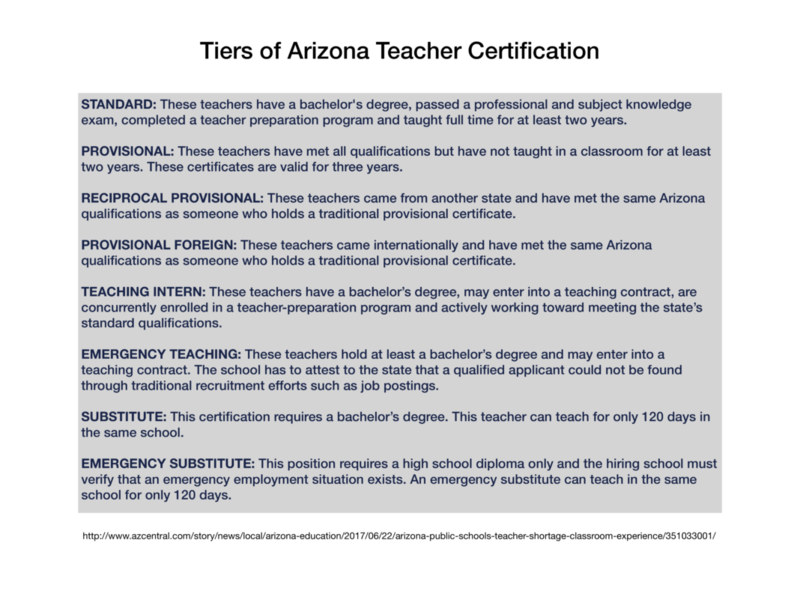 Some argue that standard certification, which in Arizona requires a bachelor’s degree, passing a professional and subject knowledge exam, completing a teacher preparation program and teaching full-time for at least two years, is not important. After all “they” say, (pandering to liberals no doubt), if Ruth Bader Ginsberg wanted to teach civics in Arizona, she wouldn’t qualify for a standard certification. Well, just because someone is a Supreme Court Justice, doesn’t mean they know how to teach. We’ve all met really smart people who couldn’t communicate what they knew. Pedagogy, the art of teaching, is a learned skill. What it really comes down to, is whether or not we believe teaching is a profession worthy of appropriate compensation, investments in professional development and the autonomy to appropriately practice their craft. I believe the answer, with our future hanging in the balance, is an easy one. Leon Panetta explains Five lessons that never seem to be learned from shutting down the government. Harming people never works. Some 800,000 federal employees have either been furloughed or continue to work without pay. They are the innocent victims of the political conflict, but they are the ones paying the price — in the form of growing anxieties and fears that come with no paychecks. Millions of other Americans are affected by the lack of services from the closure of nine departments and several government agencies their tax dollars help support. The purpose of government is not to harm its citizens but to protect them. The more you blame others, the more the public blames you. The American people are fully aware of who is primarily responsible for this shutdown. President Trump made very clear that he would be honored to shut down the government. At the urging of conservative voices outside the government, the president reversed his decision to accept a short-term extension of funding and, instead, demanded a new measure with $5 billion for his border wall. At that, the Democrats balked. The more the president tweets that Democrats are now to blame, and that the only thing that matters is the $5 billion for his wall, the more the public will hold him responsible. Update: The front page headline in the print edition of the Daily Star reads “Trump: Deaths of 2 immigrant kids ‘strictly the fault of Democrats’” Clearly Trump has not learned Panetta’s lesson. Donald gets an ‘F’. Negotiations are impossible without trust. The key to governing in our democracy is mutual trust. You must be able to rely on the word of those in the other party that they will do what they agree to do. Unfortunately, the president keeps changing his mind. He is not clear about whether he wants a “beautiful wall” or “aesthetically pleasing steel slats.” The Democrats have agreed that they will agree to more funding for “border security,” but not for a concrete wall. Surely, there is room for compromise — Democrats and Republicans have already agreed to $1.7 billion allocated during the 2017 and 2018 fiscal years for physical barriers along the border. Perhaps additional funding for different types of fencing in exchange for a fix to help the “dreamers,” young people brought to this country illegally as children, is another possibility. But even then, it is difficult, if not impossible, to arrive at any deal when so few believe the president will stand by any agreement. Never negotiate in public. The talks to avert a shutdown got off to a terrible start when the president, during an Oval Office meeting with likely incoming speaker Nancy Pelosi (D-Calif.) and Senate Minority Leader Charles E. Schumer (D-N.Y.), began arguing his position in front of White House reporters. That forced the Democrats to publicly counter his positions. Once the president stated that he would be honored to shut down the government, the door to negotiations, for all intents and purposes, closed. In all the negotiations on the budget that I took part in as both House Budget Committee chairman and the director of the Office of Management and Budget, not one took place in front of the media. Public shouting matches usually guarantee failure. If the president fails, Congress must lead. The Constitution placed the power of the purse in the hands of Congress. Successful presidents have been smart enough to know that if they want funds for a particular purpose, they have to work with Congress. In the absence of presidential leadership, it rests with Congress to do what is necessary to end this shutdown. When the House reconvenes, its new Democratic majority will likely pass a short-term extension to fund the government. Under any circumstances, the Senate should agree on a bipartisan extension of funding. The president may veto it, but it will damage him, his presidency and the country. Congress can do it. In an earlier post, Scriber reports that the Washington Post editors suggest A grand bargain on immigration to reopen the government and how Paul Waldman (PlumLine) makes it concrete. Congress, in both chambers and on both sides of the aisle, should deal Trump out of negotiations and work toward a win-win compromise. In our democracy, we govern either by leadership or by crisis. If leadership is willing to take the risks that come with the responsibility of power, we can avoid crisis. If not, we will inevitably govern by crisis. There are no winners in a prolonged shutdown. As the midterm elections made clear — those who fail the nation will not only lose the trust of the people, they will likely lose the next election. This morning, at Tucson.com (the online version of the Daily Star, we are told that Trump EPA orders rollback of Obama mercury regulations. True, but the print version has this as its front page headline: “EPA: Health benefits not worth cost of cleaning coal plants”. I take the print version as a better indicator of what we, as a nation, have become. It’s … the administration’s latest proposed move on behalf of the U.S. coal industry, which has been struggling in the face of competition from natural gas and other cheaper, cleaner forms of energy. The Trump administration in August proposed an overhaul for another Obama-era regulation that would have prodded electricity providers to get less of their energy from dirtier-burning coal plants. That’s another way in which we as a nation have self-defined ourselves. I’ve posted extensively on how our society has come to tolerate dead school children as a cost for guns for all. This is an example from November 2017 - “MAGA: Murder by American Guns Again shows our society’s criminal culpability”. You can go to the SkyIslandScriber.com and search for “J’Accuse” for a listing of related posts. Is there any hope for a society in which human health - and life itself - is on the chopping block when it comes to corporate profits? The answer is a very nuanced one. In 2018, that is, according to Leonard Pitts Jr. at the Miami Herald (reprinted in this morning’s Daily Star), calling 2018, the year we lost ourselves. Sure, we mourned for John McCain and Aretha Franklin, for example. To that list Scriber adds: A nation that accepts more mercury in our foods? A nation that thinks piles of dead school children is a cost we must bear? But Pitts sees some hope. [Bruce] Springsteen was right. It’s going to be a long walk home. But at least now, for the first time in a very long time, we seem to remember the way. On Thursday, January 3rd, the new Congress will have a strong Democratic majority. And 2020 presents another opportunity to remember the way and to let our actions be guided by our better angels. Trump Threatens to Close Border if Congress Won’t Fund Wall reports the NY Times. The implication, and what Trump really means and why, is to close off the entire southern border of the United States. Really? The whole damn thing? The stand-off between Trump (via the GOP) and the Dems gets more and more Riddikulus. I pause for a Harry Potter break, directing your attention to the entries in the Harry Potter Wiki on Boggarts and in the Muggles’ Guide to Harry Potter/Magic/Riddikulus about an anti- boggart spell. A Boggart is a shape-shifting creature that will assume the form of whatever most frightens the person who encounters it. Riddikulus is a spell used against boggarts. The caster must think of something funny while casting this spell. If successful, it forces the boggart to take the shape of whatever the caster was thinking about. As boggarts feed on fear and are defeated by laughter, the object of the spell, ultimately is to make the boggart laughable. And that might be a way to cut Trump out of the D & R negotiations as suggested by other posts this morning. Here are excerpts from the Times’ report. The president’s attempts to blame Democrats for the shutdown has gained little traction with the public. About 47 percent of adults hold Mr. Trump responsible for the shutdown, according to a Reuters/Ipsos poll released on Thursday. In contrast, about 33 percent blame the Democrats in Congress. The poll was conducted Dec. 21 through 25, mostly after the shutdown went into effect. Despite Mr. Trump’s assertions to the contrary, most Democrats support increased funding for border security. Many Senate Democrats, for instance, voted to allocate tens of billions of dollars for security enhancements in 2013, including roughly doubling the size of the border patrol, creating new electronic monitoring systems and even some additional physical barriers at certain points along the border. But that money was in the context of a comprehensive immigration overhaul that would have tried to address systemic problems. By contrast, they view Mr. Trump’s border wall as a costly and ineffective proposal. What is more, they have pointed to government accounting documents that show the Trump administration has spent only a fraction of the money allocated by Congress last year for a physical barrier along the border. Typically in spending negotiations, lawmakers join the president in hammering the opposition party over their position. But other than Representative Mark Meadows of North Carolina, who is a close ally of the president, and a handful of arch-conservative House members, most Republican lawmakers have stayed out of the fray. Even Senator Mitch McConnell of Kentucky, the majority leader, has held off, saying last week that it was up to Democrats and Mr. Trump to reach a deal and only when they did would he hold a vote. Like I said, it gets more and more Boggart-like and about the only thing that will work is to cut Trump out of the negotiations by casting the Riddikulus spell on him. Every evening, it seems, there is a bewildering array of headshots of possible Democratic candidates for 2020. It looks to your Scriber much like the array of GOP candidates at the start of the 2016 season. And that did not turn out so well. Perhaps we can winnow the field a bit. Here’s what Democrats should look for in a 2020 nominee Jennifer Rubin counseled in her Friday Washington Post column. We still don’t know which Democrats (most of them?) will run for president in 2020. Nevertheless, from the vantage point of an ex-Republican and homeless political wanderer — one who has seen her party taken over by a right-wing populist, lose intellectual respectability and endanger democratic norms — I can say to Democrats that, if you don’t know what is truly important, you’ll wind up with someone you’ll regret nominating. In assessing the candidates, here (in no particular order) are [Scriber excerpted] factors Democratic primary voters would be wise to consider. Find someone who can do the job: If and when President Trump is beaten, he’ll leave a trail of destruction — a more divided country, alienated allies, a hollowed-out civil service, hyperpoliticization (even on the Supreme Court), huge debt, even greater income inequality and emboldened international foes. Now is no time for celebrity dilettantes — and voters intuitively know it. Think about those 2018 midterm voters who defected from the GOP: In 2018, suburbanites, especially college-educated women, fled the Republican Party en masse … the base will turn out no matter who takes on Trump, but the voters who gave Democrats a shot in 2018 may revert to Republican form or just stay home if the Democrats don’t put up a credible alternative. Appeal to voters who actually care about values: the electorate … registers high levels of concern about corruption, the character of our leaders, the cruelty of their policies (especially child separation), the embrace of thuggish dictators, indifference to the environment (which is often cast in moral terms), as well as the unabashed racism and misogyny that Trump has tried to normalize … A candidate who aims to make Americans proud of their government and return character as a criteria for the presidency will go far. Look for skills and vision, not white papers: … Rather than tell voters that solutions are easy and only he/she can fix it, a candidate who explains that things are hard and complicated but that, collectively, we have the ingenuity and resources to overcome challenges will make an attractive alternative to Trump. Be wary of age: It’s not the most critical factor, but if Democrats run a septuagenarian, they give up a significant advantage in a general election against Trump. The contrast between Trump, a cultural dinosaur and technological ignoramus, and a plugged-in, accessible president who seems to be of this century, not the last, would work to Democrats’ advantage. What isn’t all that important, at least not now? Ideological labels (ask the self-appointed guardians of conservatism how that worked out in 2016); money (it’ll be there eventually); and gender. As to the last item, Democrats probably wouldn’t be wise to run two white men, but it is more important that the team be balanced than it would for the top of the ticket be a woman or non-white. Yes, African American voters are critical in many early primary states, and Hispanic voters must remain engaged, but candidates such as Sen. Sherrod Brown (D-Ohio), O’Rourke, Sen. Doug Jones (D-Ala.) and slew of white Democratic governors in the upper Midwest showed they can turn out nonwhite voters. Now, it is possible that Republicans will dump Trump and come up with a credible, responsible nominee. Chances are, however, that the country will need the Democrats or an independent movement to supply a candidate to send Trump packing. We pray they choose wisely. Can we expect some rationality about immigration? Not from the GOP. They, and Trump in particular, are driven by the rightwing base - the Coulter and Limbaugh types. Not from the Dems in the House. Pelosi seems to be on an anti-wall crusade that would please the left-of-center base. But these sides have come together in the past and can do so again, argues the Washington Post Editorial Board. They say: The way out of the shutdown has been obvious for weeks. We’ve said it before, and we’ll say it again: Mr. Trump wants money for his pet border-wall project so badly that he’s willing to stage a partial government shutdown. Democrats should let him have funding for the wall in return for a permanent fix to the immigration status of the “dreamers,” people brought to this country as children without authorization but who have been living otherwise lawful and productive American lives since then. This would be a grand bargain that would give both sides something to brag about and, in fact, simply calls on them to do a version of a deal that both Democrats and Republicans have at least tentatively embraced in the past. Mr. Trump says he wants to resolve the dreamers’ plight; Democrats have, in the past, voted for enhanced “border security,” including physical barriers. Both parties are still acting as though prolonging a shutdown, and avoiding the wall-for-dreamers deal, is in their political interest, when in fact it’s the deal that would really benefit them in the long run. It would also be the right thing to do. Let’s draw a finer distinction than that expressed by the WaPo editors. There are the Democrats, the Republicans, and Trump. Two of those entities might cut a deal but not with interference from the third. Paul Waldman, also at the Post (PlumLine), shows how the deal may be struck: The best way to force Trump’s hand? Ignore him. As Americans watch the federal government remain (partially) shut down and the president lob angry accusations at the opposition, a common response is, “Why can’t they all just sit down and work this out?” It seems like a reasonable question — if this were a different time and we were dealing with a different president. But since Donald Trump is in the White House, everything is more complicated. So the only answer may be for everyone, Democrats and Republicans alike, to ignore President Trump. Act as though he doesn’t exist and this has nothing to do with him. By which I mean that members of Congress should shut their ears to Trump’s tweets and threats and fulminations, pass something that House Democrats and Senate Republicans can live with, and then dare Trump to veto it. Because I doubt he has the guts. Negotiating with Trump might be impossible, not only because he’s committed to a border wall that Democrats won’t accept, but also because he changes his mind so frequently that his word just can’t be trusted. He could say in the morning that he’ll sign a particular compromise, then decide by the afternoon that he won’t because Sean Hannity doesn’t like it. He’ll have to agree to something eventually, but the only way forward might be to cut him out of the process until the end, then force his hand. … since it is impossible for anyone to know what the president will sign, the only real option is to cut him and the White House out of the process. House Democrats should sit down with Senate Republicans and work out their own compromise. If he read, or even just surfed the web, Trump might well take heed of the example presented by the French revolutionary, Robespierre. Here’s part of the Robespierre bio from Wiki. The very movement that Robespierre helped found, and that he used against his fellow revolutionaries, ultimately turned against him. So it might be with Trump’s “MAGA mob.” Eugene Robinson asks and answers Who’s afraid of the MAGA mob? Only Trump. And he does fear them, bigly. The latest illustration is the way he chickened out on a bipartisan agreement to keep the government fully funded, instead forcing a partial shutdown over chump change for “the wall.” I use quotation marks because there never was going to be an actual, physical, continuous wall along the U.S.-Mexico border, much less one paid for by the Mexican government. The president is desperately trying to avoid acknowledging this and other realities before the 2020 election. Anyone who thinks Trump is a master politician is wrong. He’s a master illusionist, which isn’t the same thing. Politicians can’t keep pulling rabbits out of empty hats forever. At some point, they face a reckoning, and Trump’s is well underway. It is a mistake to underestimate Trump’s base or to suggest that all the issues he raises are, because he raises them, invalid. There are legitimate reasons, for example, to want to ensure border security. But racism is not one of them, and a useless wall, meant to symbolize rejection of a brown-skinned “invasion,” is not an actual solution. And that is an excellent reason to cut him out of the negotiations that might/could/should lead to a re-opening of the government. But that’s the subject of another post today. For her part, Townsend says she has no problem with finding more money for the AG’s office.Too bad she hasn’t had the same attitude about adequately funding our public schools.During her time in the Legislature, she voted for multiple expansions (to include last year's full expansion) of Empowerment Scholarship Accounts (vouchers), multiple bills intended to make it more difficult for districts to garner locally supported funding via bonds and override, and against a 20 year renewal of Prop 301, without which, Arizona's public education system would have faced a funding cliff in 2021. I don't know what teachers Representative Townsend is worried about, but the teachers I know are very clear on what conduct is allowable in, and out of, the classroom. In fact, until this past year, (in my opinion) they were overly cautious, thinking it best to leave advocacy to others. Then though, they saw the #RedforEd wave wash across America and they realized that if things were ever going to improve for their students, it was up to them. I happen to believe they were right. During her run for the AZ House this past cycle, my wife interviewed a teacher who had left the classroom.Yes, low pay was one of the factors driving her decision, but it wasn't the primary one. Rather, she was tired of insufficient resources to do the job the way she knew it needed to be done. She was tired of giving her students less than they deserved. Please, Trump, shut up about the stock market, Fed, and everything financial. You are rocking a boat that was sailing along just fine. Please, please, let Trump just shut the F up about the stock market. I don’t think anyone believes that he is good for Wall Street or Main Street. Steven Benen (MSNBC/MaddowBlog) makes the case:As economic anxieties rise, Trump and his team make matters worse. About a week ago, the Washington Post noted that Donald Trump has kept “an almost obsessive watch on the stock market,” while complaining to aides “about how unfair it is that he is blamed for the market’s slide.” The major indexes have fallen quite a bit further since the article was published. At a certain level, the presidential agita is understandable: no one individual is ever responsible for the health of the economy, the direction of the unemployment rate, or the stock market’s fluctuations. But for Trump, the picture is more complex. For one thing, he spent months telling the public that he deserves all of the credit for Wall Street’s gains, confident that his overpowering greatness would prevent a downturn. For another, it’s easy to make the case that the president deserves at least some of the blame for recent developments. Were it not for Trump’s trade war, his shutdown, and his successful-for-now lawsuit against the Affordable Care Act, recent losses likely wouldn’t have been nearly this severe. Making matters worse, Trump and his team are making matters worse. CNBC’s John Harwood had a good piece on this yesterday. Trump’s erratic behavior and weak leadership have unsettled Wall Street and Washington alike – and there’s every reason to expect things will get worse. A responsible and mature leader, wielding a steady and measured hand, would be well positioned to make a positive difference right about now. Instead, we have Donald J. Trump, who doesn’t appear to have any idea what he’s doing. Catherine Rampbell noted on Christmas Eve, “The Keystone Cops are officially in charge of our economy.” Is it any wonder many are nervous? Rampell wrote Wonder how the Trump administration would handle a financial crisis? Well, now we know. As Trump and his surrogates love to remind us, most major economic measures — unemployment, gross domestic product, consumer spending — still look strong. Under such circumstances, it’s unsurprising that Powell has continued the gradual interest rate increases begun three years ago under his predecessor, Janet L. Yellen. Nonetheless, Trump has said the Fed should stop its rate hikes because the economy is apparently too fragile to withstand them. Instead of abiding by tradition and never talking about monetary policy, the president has gone public with his fury with the Fed. Then, over the weekend, things got exponentially worse: News broke that Trump was thinking about firing Powell. Whether Trump has the legal authority to do so remains ambiguous. Unambiguous, though, is how economically cataclysmic even such an attempt would be. There are good reasons we want central banks to remain politically independent. As Argentina, Venezuela, Turkey and other hyperinflationary economies have shown us, putting the printing press in the hands of politicians is a recipe for disaster. Politicians always have an incentive to crank out a little more money today, which juices growth in the short term but jeopardizes price stability in the long run. Scriber adds: Trump, with the enthusiastic support of his secondary cabinet (aka Republicans in Congress), already cranked out more money to juice growth – that would be the tax cut for the rich. Rampell has lots more to say about Trump’s Munchkin at Treasury but I will let some other columnists weigh in. Bill Saporito, contributor to the NY Times editorial board, fingers Trump’s King Minus Touch. Whatever the president says, the Fed chairman, Jerome Powell, is not the problem. Trump spent the week before Christmas doing what Trump does: shifting blame for his own misdeeds and warped political calculations to others. This time he launched attacks against the Fed and its chairman Jerome Powell. The problem, of course, is not the Fed. The problem is Trump and his minions. The Federal Reserve Board has had the temerity to do exactly what it had signaled for months it would do, steadily raise interest rates to prevent the economy from overheating. The Fed is legally mandated to maximize employment and contain inflation, not to prop up the stock market on presidential orders. Mr. Powell also signaled that the Fed would pause in this rate-raising mode if the economy began to slow. Wall Street was not surprised in the least by this pronouncement. What surprised Wall Street — what terrifies Wall Street — was Mr. Trump’s inquiry as to whether he had the power to fire Mr. Powell, whom he appointed in February. That injection of uncertainty was then magnified when Mr. Mnuchin announced from his Mexican vacation spot that he had chatted with six big bank C.E.O.s in an attempt to assure investors that there was adequate liquidity in the financial system. Anyone who experienced the Great Recession might recall that merely raising the idea that there might not be adequate liquidity immediately injects doubt into investors’ minds about adequate liquidity, whatever assurances you attach afterward. The Dow promptly had its worst Christmas Eve trading day ever, disgorging 653 points, or 2.9 percent. In Mr. Trump’s snow-globe reality, our days are merry and bright as long as he’s in charge. It’s only when those other fools interfere — the courts, Congress, whoever is chief of staff — that things go wrong. Thus the government shutdown that he bragged he would own he now says belongs to the Democrats. No one is buying that one, not even in his own party. And no one is buying his $5 billion Mexico wall, either. And that includes the Mexicans. Nor should they. The number of people entering the United States from Mexico has been declining for a decade, but Mr. Trump has now wasted hundreds of millions of taxpayer dollars placing American troops in Texas to protect us from an immigration threat that doesn’t exist. While a paralyzed federal government is not yet damaging the economy, the damage from Mr. Trump’s other personal policy perversions is piling up. On its own, the economy, while clearly slowing, is doing well enough and will probably continue to do well enough with minimal fine tuning. Mr. Trump complains bitterly that Mr. Powell is going to turn him into Herbert Hoover by doing what the Fed is mandated to do. But what turned Hoover into Hoover is a Federal Reserve that did nothing and a Republican Congress that conducted a disastrous trade policy rife with tariffs. The really scary part, if one continues this historical comparison, is that the Great Depression was ended not as much by smart economic policy as it was failed foreign policy marked by American isolationism in the years leading to World War II. Today, Mr. Trump’s America First posture is behind his abrupt decision last week to withdraw antiterrorism troops from Syria. His own generals — “my generals” — and national security staff have warned that such a retreat could allow the shattered ISIS to regroup and spread global chaos again. Paul Krugman also writing in the Times, provides some cautionary comments in The Ghost of Trump Chaos Future. Sorry, investors, but there is no sanity clause. The truth is that most of the time, presidential actions don’t matter much for the economy; short-term economic management is mainly up to the Fed. But when bad things happen, we do need the White House to step up. In 2008 and 2009, it mattered a lot that officials of both the outgoing Bush administration and the incoming Obama administration responded competently and intelligently to the financial crisis. Unfortunately, there’s no reason to expect a comparable degree of competence if something goes wrong again. Consider how the Trumpistas have responded to falling stocks. So far these are just a minor economic bobble. Yet Trump himself, having claimed credit when stocks were rising, has flown into a rage and lashed out; hence the attacks on Powell. Meanwhile, top officials are still claiming that last year’s tax cut was a triumph in the teeth of the evidence, and issuing bizarre statements — via Twitter — about the health of the banks, which nobody was questioning. Now imagine how this administration team might cope with a real economic setback, whatever its source. Would Trump look for solutions or refuse to accept responsibility and focus mainly on blaming other people? Would his Treasury secretary and chief economic advisers coolly analyze the problem and formulate a course of action, or would they respond with a combination of sycophancy to the boss and denials that anything was wrong? What do you think? Let’s be clear: There isn’t an obvious crisis-level threat looming at the moment. But growth is slowing, and as the bumper stickers don’t quite say, stuff happens. And if and when it does, the people who would be supposed to deal with it are the gang that can’t think straight. Merry Christmas. It seems that we are in for a financial rough ride as we “brace for King Minus’s next touch.” Or maybe not so much if Krugman’s “minor economic bobble” is not a bursting bubble. UPDATE: I compiled all those posts on Dec. 26. By the end of the day the DJIA closed at 22,878, up 1,086. That’s good news and not just because investors have some reason to hope. The gloom-and-doom tenor of what I posted was triggered by worries about what Trump might do to the Fed given his threats to fire the Fed chair. But the other theme in yesterday’s post was that the economy as as whole was healthy, there was some hope that getting Trump to calm down might settle everyone’s financial nerves. The NY Times report yesterday afternoon explains why the market reacted the way it did in Stocks Bounce Back From Edge of Bear Market. Stocks broke their losing streak on Wednesday, as sales data showed spending by American consumers remains healthy and Russia signaled that it was willing to help keep oil prices higher. Investors were also reassured by a White House official’s statement that Jerome H. Powell’s job as Federal Reserve chairman was “100 percent” safe. However, one day’s data point does not make a trend. Take the opening Dow on the week of Dec. 3rd as a bench mark, 25,826. By the 24th, the Dow had lost 4,034. Today’s reversal with the 1,086 gain is welcome, but the Dow is still about 3,000 shy of its opening at the beginning of the month. Perhaps if Trump will keep his mouth shut, the markets will make up the rest of the ground lost in December. I suspect many if us will breathe a big sigh of relief if the reversal in trends holds for the remainder of the week and we see continued recovery of market losses. Stay tuned. Dec. 27 - The Dow ended at 23,138 - up 260 points. Perhaps Trump heard my opening exhortation and shut up about the economy, the Fed, and anything that might spook investors. But also bear (pardon the pun) in mind that we’re not that far from a Bear market and the Dow swung 870 points! As one observer heard on TV this morning put it, what is predictable is more volatility. Quote of the Day: "We strongly believe that no country should have to sacrifice their economic prosperity or energy security in pursuit of environmental sustainability.” – Wells Griffith, Mr. Trump’s international energy and climate adviser. That is the short answer to why Gaia weeps. Following are some details. The Editorial Board of the New York Times says Trump Imperils the Planet. Endangered species, climate change — the administration is taking the country, and the world, backward. Tump’s Christmas gifts to the nation - and to the planet. Gaia defined: In Greek mythology, Gaia (/ˈɡeɪ.ə/ or /ˈɡaɪ.ə/; from Ancient Greek Γαῖα, a poetical form of Γῆ Gē, “land” or “earth”), also spelled Gaea (/ˈdʒiːə/), is the personification of the Earth and one of the Greek primordial deities. Gaia is the ancestral mother of all life: the primal Mother Earth goddess. Message to Republican Senators - You are America's Board of Directors. Your CEO, Trump, lies to you 10 times a day. He cannot be trusted. Fire him NOW. Hey, Chamber of Commerce! 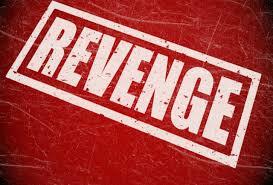 Hey, Republican Senators! Are you attending? Imagine you are a Board of Directors trying to run a business in which your CEO lies to you ever single waking hour, every day, every month, every year. He spends his time in front of a television that feeds him false information about the state of our economy. He threatens and bullies you Directors. You cannot trust his claims about business operations. Importantly, you cannot trust his claims about profitability. If you do, your shareholders will revolt and you will be out of a job. It is an act of self-preservation that is warranted. Fire the lying SOB and do it now. That is another way of expressing Tom Friedman’s thoughts in his essay Time for G.O.P. to Threaten to Fire Trump. He argues that Republican leaders need to mount an intervention. … this is not just about the world, it’s about the minimum decorum and stability we expect from our president. If the C.E.O. of any public company in America behaved like Trump has over the past two years — constantly lying, tossing out aides like they were Kleenex, tweeting endlessly like a teenager, ignoring the advice of experts — he or she would have been fired by the board of directors long ago. Should we expect less for our president? … Trump’s biggest disruption has been to undermine the norms and values we associate with a U.S. president and U.S. leadership. And now that Trump has freed himself of all restraints from within his White House staff, his cabinet and his party — so that “Trump can be Trump,” we are told — he is freer than ever to remake America in his image. If America starts to behave as a selfish, shameless, lying grifter like Trump, you simply cannot imagine how unstable — how disruptive — world markets and geopolitics may become. So again CoC and Senators: start behaving as the fiscal conservatives you claim to be. Act as a Board of Directors composed of members of both political parties acting on behalf of and in defense of the giant corporation known as the United States of America. Fire Trump and do it now. As one of your shareholders, I demand it of you. Gentle Correction: Friedman was wrong about the number of lies; it’s far worse. The Washington Post’s Fact Checker updated his count on December 20th: In 700 days, President Trump has made 7,546 false or misleading claims. The Fact Checker’s ongoing database of the false or misleading claims made by President Trump since assuming office. Updated Dec. 20, 2018. That’s 10.78 lies per day. I may have over-reacted with the title of this post. Democracy may not be dead - yet. But it looks to me like Trump is moving toward anointing himself as King Donald. He is maneuvering to give himself the freedom to do whatever he pleases, whatever his “gut” tells him to do. All that without any effective constraints on his maniacal whims and malicious grudges. Consider the out-flow from the Trump administration of ‘adults in the room’ - either by being forced out by the resident autocrat, or by fleeing a vision of impotence, or by taking issue with said autocrat. Nikki Haley, ambassador to the U. N., is leaving this month. Gary Cohn, economic advisor, gone. Rex Tillerson, Secretary of State, gone. Generals McMaster, Kelly, and now Mattis, all gone or soon to be gone. With Mattis’ departure, there is no one left in the White House to resist Trump’s impulses (that are driven by inexperience, incompetence, and indifference to consequences). "This is a rogue presidency,” said Barry McCaffrey, a retired four-star Army general. Following on, ’A rogue presidency’: The era of containing Trump is over writes Phillip Rucker, White House Bureau Chief for The Washington Post. Rucker certainly knows the implication of that assertion. If we can no longer contain Trump, then Democracy is dead, to be replaced by a corrupt monarchy. … the result has been disarray. The federal government is shut down. Stock markets are in free fall. Foreign allies are voicing alarm. Hostile powers such as Russia are cheering. And Republican lawmakers once afraid of crossing this president are now openly critical. "Trump wants total freedom to do what he wants when he wants and he’s much closer to getting that, which is what will terrify not only Congress but the rest of the world as well,” said Thomas Wright of the Brookings Institution. The characterization of Trump’s remaining followers as “opportunists, schemers and careerists” sounds an awful lot like the courtiers in a corrupt court ruled by a Mad Monarch. Let’s push the analogy to a monarchy further. A Parliament, such as that in the UK, should place constraints on what a monarch can do. Our House of Commons will flip to the opposing party in January. But our House of Lords remains loyal to King Trump. Moreover, the Lords have the vote on who sits on the highest court in the land. The saga is not yet done. More damage to our democracy is on the horizon. The latest salvo from the throne is Trump’s attack on the Fed, blaming the Fed Chair, Jerome Powell, for the stock market sell-off. The NY Times reports that the Stock Market Rout Has Trump Fixated on Fed Chair Powell. Of course, the erratic behavior of a Mad King would have done nothing to trigger said rout - nothing but fueling it with chaos and uncertainty. For example, CNN Business reports that the Confusing signals from Washington send markets plunging. This is the most beautiful, biggest and best stock market crash ever. The market recovered late morning, but then slid even lower after President Donald Trump tweeted: “The only problem our economy has is the Fed.” Investors are concerned that Trump may fire Federal Reserve Chairman Jerome Powell. And all Trump could do is tweet: “The only problem our economy has is the Fed. They don’t have a feel for the Market, they don’t understand necessary Trade Wars or Strong Dollars or even Democrat Shutdowns over Borders. The Fed is like a powerful golfer who can’t score because he has no touch - he can’t putt!” And that display of ignorance and psychological projection served to worsen the market. After another brutal day on Monday, the Dow is 18.8%, or 5,036 points, off its peak reached on September 20. The S&P 500, also near a bear market, is down 19.8% from its high point October 3. Oil fell more than 6% on Monday to below $43 a barrel. “The confusion and disorder surrounding this week’s spending debate suggest fiscal deadlines in 2019 — including the debt limit deadline, which we expect to fall between August to October — could be more disruptive than they have been since the 2011–2013 period,” Goldman Sachs economists wrote in a research note. Another way to look at the stock market losses is that we’ve not seen a Dow this low since September 1, 2017. CNN concludes: “Still, some market veterans argue that a panicky Wall Street is prematurely pricing in a recession that may not hit until 2020.” Scriber hopes so. But there’s a lot of crazy sh!t the Mad King can throw at the world in the meantime. Famed Indonesian volcano Krakatau erupts causing tsunami that kills hundred. Indonesians worry another tsunami is coming, as 5,600 are displaced and hundreds are dead or injured. When the Scribers were scuba divers, we traveled to Indonesia three times. On the first trip we were ship-wrecked and housed by the Indonesian navy on the atoll of Mapia; enough about that. Our second trip started in the city of Denpasar on the Island of Bali, then to Makassar and then to Sorong on the Northwest coast of West Papua, there to dive the islands of Rajah Ampat (“four kings”). We then sailed southward across the Banda Sea ending up on the island of Flores and then back to Bali(1100 miles at sea). Our third trip, also starting in Denpasar and Makassar, we began our voyage in Ternate on the island of Halmahera and on to Rajah Ampat again and returning via Sorong/Denpasar. Arguably we experienced the most biodiverse underwater environment in the world. 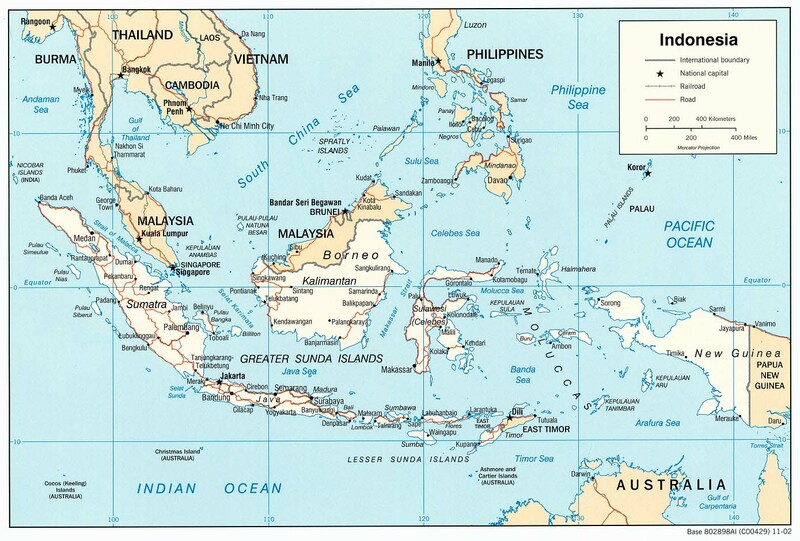 Down in the lower left of the next map, you will see two largish islands, Sumatra on the north and Java on the south. Between lies the Sunda Strait and in it the volcanic island Krakatoa (aka Krakatau). 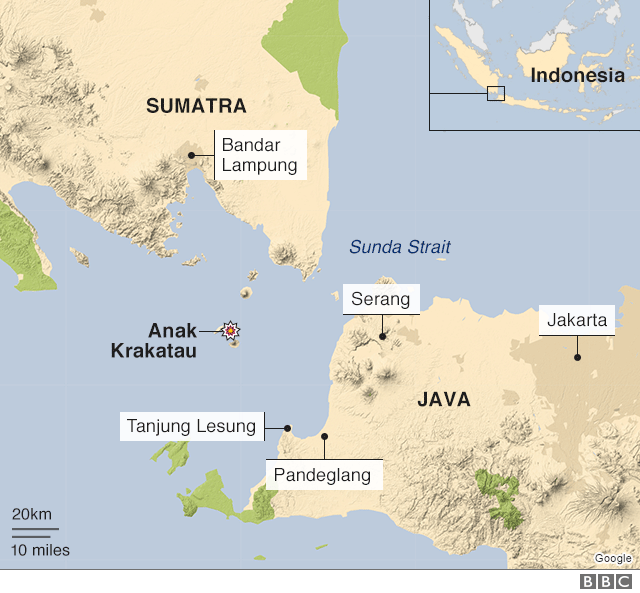 That is the site of the volcanic eruptions subject of the old film Krakatoa, East of Java and more recently thought to be responsible for the deaths of hundreds of Indonesians on Java due to a monstrous unpredicted tsunami, more specifically in the district of Pandeglang. That should give you a feel for the geography of the area when the morning news reports on this tragedy. I take exception to some of the reporting. Indonesia, you now see, is an enormous country spanning thousands of miles. The tsunami doesn’t just hit “Indonesia”. You need to ask where. We also need to know why. The [CNN story], among other reporting resources, informs us that the early warning detectors available to Indonesia were tectonic activity. The latest tsunami was triggered by a volcanic-induced underwater rock slide. Many witnesses said Saturday’s tsunami struck with no warning, and President Joko Widodo, who was scheduled to visit the disaster zone Monday, has ordered the country’s Meteorology, Climatology and Geological Agency to purchase detectors to provide early warnings to Indonesians. The Indonesia Ministry of Maritime Affairs’ censors “did not sound early warning because they are for tectonic activity not volcanic activity,” spokesman Rahmat Djamaluddin said. Anak Krakatau is known for its 1883 eruption – one of the deadliest in recorded history – that killed more than 36,000 people. So the most recent Indonesian tsunamis could have been far worse, and in the future are likely to become so without proper detection - at the very least. Trump readily accepted credit (falsely) for the run-up in stock prices during his two years in office. The run-up has now become a down-turn that wiped out any gains during the past year. But he is playing his usual script. He’s looking for someone else to blame and, the NY Times reports, the Stock Market Rout Has Trump Fixated on Fed Chair Powell. WASHINGTON — President Trump has unabashedly hitched his political fortunes to a rising stock market. Now, with stock prices in retreat, he has become increasingly fixated on the idea that one man is to blame for the recent rout: Jerome H. Powell, chairman of the Federal Reserve. After the Fed raised its benchmark interest rate on Wednesday, the fifth consecutive quarterly increase, Mr. Trump fretted to aides that Mr. Powell would “turn me into Hoover,” a reference to the man who was president in the early years of the Great Depression. Mr. Trump has said choosing Mr. Powell for the Fed job last year was the worst mistake of his presidency, and he has asked aides whether he has the power to fire him. But the volatile stock market, which just posted its worst week since 2008, is falling in part because of Mr. Trump’s own policies, including an escalating trade war with China, a shutdown of the federal government and the fading effects of the $1.5 trillion tax cut Mr. Trump ushered in at the end of 2017. While the Fed’s rate increases have upset investors — who seem to have a darker view of economic growth than the central bank does — some analysts said Mr. Trump’s musings about the Fed would only exacerbate anxieties. Mr. Trump’s economic advisers scrambled over the weekend to reassure markets that Mr. Trump was not, in fact, planning to fire Mr. Powell. Treasury Secretary Steven Mnuchin tweeted what he said was a quote from Mr. Trump accepting that he did not even have the power to do so. Mr. Mnuchin has worked in recent days to obtain Mr. Trump’s assurance that he would not remove Mr. Powell, according to an administration official who spoke on condition of anonymity. But that person cautioned that Mr. Trump could change his mind. The person noted Mr. Trump has a tendency to nurse grudges even when he temporarily sets a subject aside. The take-aways, above in bold, are (1) Trump’s own actions rattled the market, (2) he could go against his economic advisors and make things worse, and (3) even if persuaded to back off, he could take action against the Fed at some later time to screw things up royally. Here are the themes, schemes, memes, and falemes from the Great Blue Meanie at Blog for Arizona. It’s been a couple of thousand years and there still is no room at the inn. The Trump solution is to lock ’em up - in cages, that is. Congress unlikely to fund Trump’s wall. Trump’s Plan B: crowdsourcing. Plan C: wait for Mueller to build the wall (around Trump, that is). Trump predicts a long shutdown. He has 2020 in mind. Relative to his gut, the only thing smaller than Trump’s brain is his heart. When accepting the mantle didn’t work, the Mad Moron of Mendacity is trying to blame the Dems for his Christmas present to the nation. Putin and Erdogan thank Trump for their Christmas presents. Trump flashes victory V sign. Mattis reciprocates with middle finger. There was some hope that Trump’s military advisors (Mattis, Kelly, Mcmaster) could restrain him. No such luck. Trump Foundation dissolved because of illegal activities. No more Christmas presents for the Donald. Trump claims all the donations to his foundation went to Charity. Scriber asks: what’s her last name? Maybe, by this time next year, we’ll have locked him up. Maybe. Scriber ends with Trump’s Christmas list for Santa. The problem is that all this is not a game. Trump’s chaos has real consequences. Our soon-to-be former allies look on with amazement as Trump gets cover from a cowardly Congress. Pardon me while I digress to create an analogy. I want to insert a vivid, visual image into your stream of consciousness. Imagine that Donald Trump gave up golf at the beginning of his presidency. Instead, he occupied himself playing paintball. [The] paintball marker, also known as a “paintball gun” is the primary piece of equipment, used to mark the opposing player with paintballs. …Paintballs, the ammunition used in the marker, are spherical gelatin capsules containing primarily polyethylene glycol, other non-toxic and water-soluble substances, and dye. The quality of paintballs is dependent on the brittleness of the ball’s shell, the roundness of the sphere, and the thickness of the fill; higher-quality balls are almost perfectly spherical, with a very thin shell to guarantee breaking upon impact, and a thick, brightly colored fill that is difficult to hide or wipe off during the game. The highest-grade paintballs incorporate cornstarch and metallic flake into the fill to leave a thick glittery “splat” that is very obvious against any background color, and hard to wipe off. Now your vision has president of the most powerful nation on earth playing poopball. All that would certainly attract attention. Instead of sh!t, substitute “chaos” and there you have the theory espoused by today’s columnists: that Trump practices the use of chaos to garner for himself a load of attention. His apparently random acts are really intentional devices wielded for the purpose of grabbing the attention he craves. Two years in office can be parentally characterized as Trump’s Terrible Twos. It’s been one poopball splat after another. Susan B. Glasser (New Yorker) surveys The Year in Trump Freakouts. Jim Mattis is out, the President is leaving Syria without consulting anyone, and that’s just this week in crises of the President’s own making. President Trump is ending the year as he began it: outraging Washington with a Twitter diktat, one that was cheered in Moscow and jeered on Capitol Hill. On Wednesday morning, the city awoke to an unexpected Presidential announcement that Trump was unilaterally pulling American forces out of Syria, despite having agreed this fall that U.S. troops would remain on the ground there indefinitely. Trump portrayed the decision as both a final victory over the Islamic State, which had overtaken much of the country from the Russia-supported regime of the Syrian dictator, Bashar al-Assad, and the fulfillment of a campaign promise to exit the Middle East. A full-scale bipartisan freakout ensued, culminating late Thursday with the long-awaited, long-feared news that Defense Secretary Jim Mattis would join the procession of Trump officials calling it quits. Was it a direct result of the abrupt about-face on Syria? 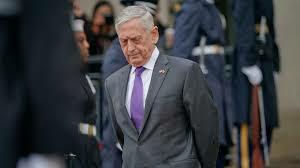 “I believe it is right for me to step down from my position,” Mattis wrote in his resignation letter to the President, “because you have the right to have a Secretary of Defense whose views are better aligned with yours.” What we do know is that all the chaos at year’s end is a powerful reminder that the manner in which the President operates is so outside of any normal parameters for governing, so disdainful of process, and so heedless of consequences that his decisions don’t resolve crises so much as create them. So what will Trump do about that accumulation of aggravations? (And it does seem that Trump brushes aside any consequences of his actions as mere aggravations.) Think of it. Trump talks turkey with Erdogan and then withdraws U. S. troops from Syria leaving what is believed by other observers to be a significant ISIS force in place and exposing our allies, the Kurds, to Turkish attacks and Secretary of Defense Mattis resigns in protest. Unprecedented! So we attend to Trump’s latest travesty. The answer to my question is that he will shoot some more. Splat! More chaos. A governmental shutdown he blames on the Dems (even though he took responsibility last week - but that was last week). John Cassidy (also at the New Yorker) reveals Donald Trump’s Survival Strategy: Chaos, Diversions, and Lily-Livered Republicans and explains his view of the chaos-as-attention theory. It’s time we revisit that famous op-ed of yours. In September, you acknowledged that you were a member of the “quiet resistance” within Donald Trump’s administration. You told us that you and others were “working diligently” to “frustrate parts of his agenda and his worst inclinations.” You said that while you agreed with many of the president’s policies, you were appalled by the president’s amorality, his chaotic management, his “repetitive rants,” his fondness for dictators. You also believed that your efforts to resist Trump were often successful. On foreign policy, you noted, the administration’s policies were far more sober and serious than the president’s reckless rhetoric. Mattis resigned because he no longer shares your analysis. He no longer believes he can be a steadying or blocking force in the councils of government because it isn’t clear there are “councils of government.” Donald Trump made a snap decision to remove U.S. troops from Syria following a phone call with Turkish president Recep Tayyip Erdogan. He did so over the unanimous objections of his national-security team. He did so after leading members of that team had said publicly and recently that the U.S. would not withdraw. A president who sticks it to his own team while sticking with a foreign strongman is not worth sticking by. Mattis also resigned because he has concluded that the problem with Trump isn’t that he’s an empty vessel. It’s that he’s a malignant one. Here was the fundamental mistake in your view of Trump: You thought he could be handled. You thought of him as a child who simply needed to be kept away from dangerous toys, as former economic adviser Gary Cohn did when he removed a letter from the president’s desk ordering the end of the Korea-U.S. free trade agreement. But our Commodus-in-Chief isn’t just an irascible buffoon whose worst impulses can be confined to Twitter but whose policy instincts largely align with yours. Trump thinks of himself as a man of ideas. Withdrawal from Syria, along with partial withdrawal from Afghanistan, is consonant with the quasi-isolationism he’s preached for decades. He is sympathetic to Erdogan, as he is to other tyrants, because he is indifferent to considerations of human rights and civil liberties. So it is with you, Anonymous, wherever you might work in the administration. Until now, you may have convinced yourself that real honor lay in putting up with it — with the craziness of your boss and the disdain of your neighbors — because the good of the country (as you see it) demanded it. And until now, you had Mattis to serve as your role model. But Mattis is going. And the argument can no longer be sustained. If Trump is capable of doing this to Mattis, what’s to keep him from soiling your carpet, too? And even if he never gets to it, you must know by now that you are no longer keeping a bad thing from getting worse. All you are doing is disguising how bad it is, thereby helping it to become worse. Trump will never have trouble surrounding himself with ambitious and unscrupulous flunkies. Do you want that to describe you? Get out while you still can, whoever you are. Scriber looks at “ambitious and unscrupulous flunkies” in a broader way: What an awful condemnation of the “Lily-Livered Republicans” in the Congress of the United States of America. President Trump’s capitulation to Turkish President Erdogan’s demand for U.S. troops to leave Syria takes me back to 1989 when I was assigned to Incirlik Air Base in Turkey. It was during Operation DESERT STORM that I first learned about the Kurds and Turkey’s desire to destroy them. Even while we were busy securing a no flyzone to protect the Kurds, the Turks were using joint intelligence to go after them. I knew the Turks considered them terrorists, but hey…one man’s terrorist is another man’s freedom fighter. My country had the latter opinion – back when we at least pretended to care about “little” things like human rights. As a young Captain assigned to the 39th Combat Support Squadron at Incirlik AB, I was in charge of food service, lodging, furnishings management and the milk, laundry, and mortuary operations at the base. Initially a sleepy hollow, things heated up real quick when Saddam Hussein invaded Kuwait. We received the execution order for Operation Desert Storm (to expel occupying Iraqi forces from Kuwait) on January 13, 1991, and the ensuing six weeks were the most satisfying of my entire 22-year career. My provisional squadron of 95 personnel and I were doing what we’d trained to do and everyone was committed to the mission at hand. At our level at least, there were no mixed messages. We were there to fly, fight, and win. It was hard work, but we believed in the mission and knew we had the full support of our commanders, to include our commander-in-chief. “I have a substantial chance of winning. If I win, I don’t want to broadcast to the enemy exactly what my plan is." Evidently, he has no problem now with announcing his intent to cut and run. It should tell us everything we need to know that both Erdogan and Putin praised ”the Donald’s" withdrawal of U.S. forces. Trump is giving them exactly what they want. “I don’t lose any sleep at night over the potential for failure. I cannot even spell the word." Yet, he has now been forced to recognize that his only recourse to the craziness coming out of the Oval Office, is to basically admit failure and resign in protest. This president HAS been tested by a "major national-security crisis", continues to be tested every single day, and is found to be severely wanting. Although there are plenty of people who seem to think that a foreign power influencing our elections is just politics as usual, it is not political, nor is it usual. What it is, is sophisticated cyberwarfare and it should not be tolerated, not for one red-hot second. Not only has Trump tolerated it, he invited it and has essentially worked to provide top cover for it ever since he was elected. Thus far, General Mattis had been successful at moderating Trump’s dangerous, knee-jerk tendencies. From Trump’s disdain for NATO, to his desire to strike North Korea and/or withdraw from the Korean peninsula, to his demand to kill Bashar al-Assad, and much more. Time and again, Mattis managed to talk Trump down from potentially disastrous decisions, smooth the ruffled feathers of our allies, and remain effective at providing top-cover for the troops. Now as this last line of defense crumbles, we must see Mattis’ resignation as a serious wake up call. We, the American people, must demand of Congress, a co-equal branch of government to the Executive, to be the check on a president who would be king. Otherwise, as his malfeasance continues to catch up with him and the walls close in, he will become increasingly desperate to deflect blame by creating chaos. So much has happened in the last two-plus years that we never could have imagined. Is it really that unimaginable that this President would create a situation to grab more power by declaring martial law or, God forbid, launch nuclear weapons? Is it?